With Contagion, director Steven Soderbergh and writer Scott Z. Burns have crafted a viral outbreak movie that differs from the norm. This one has a very realistic feel to it as it examines the way a fatal pandemic begins, how it spreads, who tries to stop it and how. We also get a look at the effect it has on people, as well as that of the efforts to contain it. The film has similarities in its matter-of-fact tone and multi-character structure to Soderbergh’s 2000 drug trade film Traffic, but Contagion places less focus on the characters and more on the core subject. The virus is always the center of attention. It comes from Chicago. Or Hong Kong. Or somewhere else. Nobody knows at first. What’s initially thought of as just a fluke occurrence or two soon manifests itself as a highly contagious disease. People who contract it get a nasty cough and might die within a day or two. The mortality rate is estimated at one in four, but that might be incorrect. Through carefully zoomed-in shots, we become aware of the way it spreads before the characters explain it explicitly. A handshake. There’s the virus. A credit card being handed to a cashier. The virus is there too. And in a world where jet planes fly halfway across the planet in a day, we know contagions spread easily. As said, there are plenty of characters in this movie. Beth (Gwyneth Paltrow) is the first one we see as she sits in a hotel lobby coughing. She might well be Patient Zero. Dr. Cheever (Laurence Fishburne) at the Centers for Disease Control and Prevention spearheads the work to contain the virus. He might find himself biting off more than he can chew. Working with him is the driven Dr. Mears (Kate Winslet) who’s sent to Minnesota to investigate one cluster of the disease. Dr. Orantes (Marion Cotillard) of the World Health Organization, meanwhile, is sent to Hong Kong for similar reasons. Scientists, most notably Sussman and Hextall (Elliott Gould and Jennifer Ehle) work tirelessly to come up with a vaccine. Inserting himself into the mix is freelance journalist Alan Krumwiede (Jude Law), spreading conspiracy theories and sowing dissent online. There are reasons for his actions. While all this is going on, family man Mitch (Soderbergh-veteran Matt Damon) loses his wife and one of his children to the virus but is given little time to grief as his older daughter (Anna-Jacoby Heron) still needs to be kept safe from the contagion. Mitch himself appears to be immune, but others in the cast will contract the virus. The realistic tone of Contagion occasionally reminded me of Paul Greengrass‘ 9/11 drama United 93. 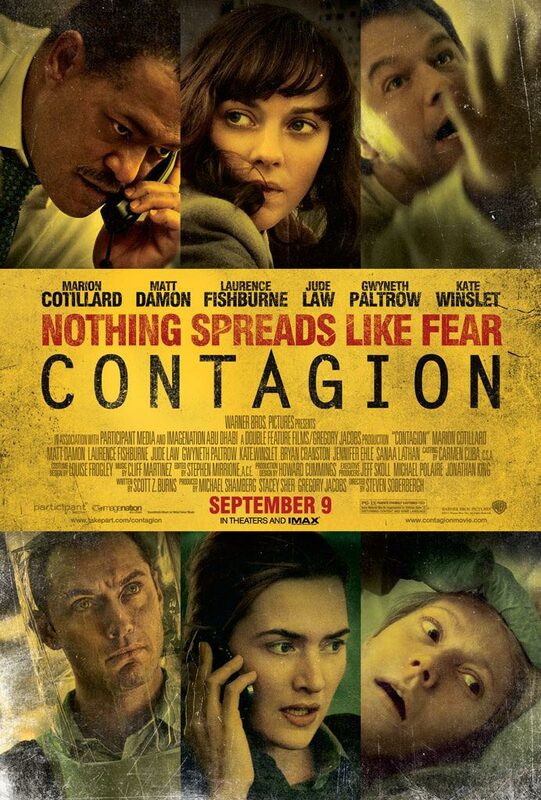 Particularly in the early goings where nobody is really sure what’s going on, the same sense of helpless dread is present, if not to the same degree of effectiveness (the first act of Contagion moves a bit slow and is bogged down somewhat by technical jargon). But once the ball really gets rolling, the film’s strive for realism becomes it’s greatest asset. Why? Because it’s different and fresh. There’s no immediate breakdown of human civilization, no sensational miracles and no evil army sent out to reinforce quarantines by any means necessary. 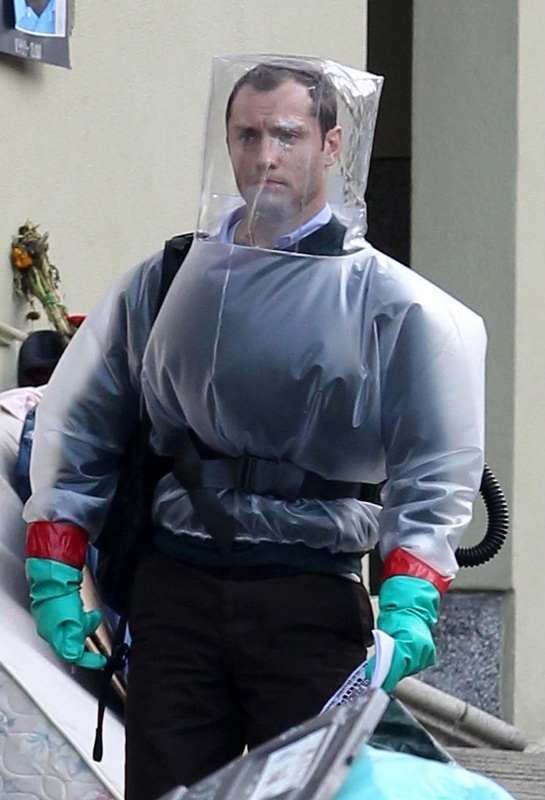 The aim is to paint a picture of what a large-scale outbreak could be like if it happened in real life, and the film certainly feels believable. The movie jumps back and forth between all its characters and their story arcs (which rarely intersect directly). At times the film gets too crowded, leaving some people on the sideline for a bit too long. Most egregious is the case of Cotillard’s character, who very much disappears during the film’s second half and had me going “Huh? Oh, right, she’s still here” when she suddenly popped up again. Her story could have used another scene or two both to keep it in the viewers’ mind and to flesh it out more. It’s easy enough to infer what happens as it is, but the emotional weight is diminished when we don’t get to see it. But in a way, this works to hammer home the point that the film is about the virus, not the people. All story threads are resolved in the end, but the aftermath for many characters is left ambiguous. 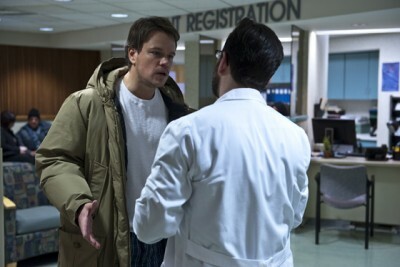 While Contagion isn’t a perfect film, the good far outweighs the bad. It engagingly shows many different aspects of the outbreak in its effect in personal (Mitch and Beth), professional (the doctors) and social (Alan) spheres. The actors all deliver good to great performances, with Winslet and Law leaving the strongest impressions on me. It’s shot beautifully and has an oddly fitting score. Is it Soderbergh’s best film ever? No, but it puts in a very admirable effort. It’s more ambitious than your standard Hollywood flick (the star-studded cast and the marketing gives off that vibe) and its stark tone which might turn some people off. For those willing to immerse themselves in its narrative, a feast is waiting.